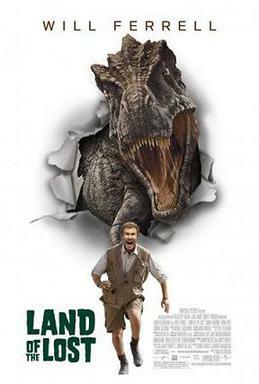 Plot: - Three years after being kicked out of the science department for his theory of time warps and his attack on Matt Lauer on The Today Show, paleontologist Rick Marshall (Will Ferrell) is reduced to working as a teacher for children at the George C. Page Museum until he meets Holly Cantrell (Anna Friel) who urges him to finish his tachyon amplifier after presenting him with a fossilized imprintation of his lighter. When he does, they go to the Devils Cave where Holly found the fossiled imprint, with tour guide Will Stanton. Marshall activates the T-amplifier triggering an earthquake, and the three end up in a parallel universe having lost the amplifier. Finding themselves in a strange world without the tachyon amplifier, the befriend a Pakuni named Chaka before falling into the feeding grounds of a Tyrannosaurus which then chases them until they reach a crevice in a cave, momentarily giving up though bent on eating Marshall for insulting him during the chase. Holly, knowing the dinosaur's attitude, gives him the name "Grumpy". The next day, Marshall has visions about a strange creature begging for his help and goes to find the Lost City where they encounter a strange glass beacon, the Pylon, that turns into a vocoder when they touch it before being attacked by creatures called Sleestaks. When the Pylon opens, Marshall enters, meeting the creature Enik. Enik tells them that the evil Zarn is out to control the universe and needs the tachyon amplifier. Chaka takes the group through the jungle and onto a salt flat landscape, filled with numerous jumbled objects and landmarks. The others discover that the area is a feeding site for Compsognathus and Velociraptors, who attack a wandering ice cream man, until Grumpy comes and scares them off. An Allosaurus arrives as well. The two territorial predators prepare to fight when they both catch Marshall's scent and chase after him. Marshall runs from "Big Alice", and liquid nitrogen to freeze the Allosaurus to death, then finds the tachyon amplifier among her remains before a Pteranodon took it. After getting the amplifier back, the group takes a break at a motel in the salt flat. While Marshall, Will and Chaka laze in the pool, Holly repairs the amplifier and wanders off. She finds dinosaur eggs and takes one before accidentally triggering a holographic message from the Zarn, learning that Enik is the real villain. Marshall, Will, and Chaka realize Holly is missing and leave to find her. Finding two mating Sleestaks who shed their skin, Marshall and Will use the shed skin to disguise themselves while Chaka takes the tachyon amplifier to Enik. Holly has been captured by Sleestaks and brought before the Library of Skulls to be judged, Marshall and Will arriving to learn that Enik is the villain. After fighting for their lives, the group is ambushed by Enik as he reveals his plan to use the Sleestaks to take over the Earth. He then leaves Marshall and company to their fate as Grumpy arrives to get his revenge. Marshall takes on Grumpy one-on-one, resulting him being eaten as the dinosaur left. Holly, Will, and Chaka attempt to fight off the numerous Sleestaks. Once they are surrounded, Marshall returns to kill most of the Sleestaks with Grumpy's aid, having made their peace with eachother. Marshall and company manage to stop Enik as the portal back to Devil's Cave begins to close. Will chooses to stay with Chaka in the Land of the Lost so Marshall and Holly can return home. Back on Earth, Matt Lauer gives a second interview with Marshall, ending with Lauer's attempt on Marshall's life for his slander against him. Soon after the show ends, left in the studio by accident, Holly's dinosaur egg hatches into a baby Sleestak.